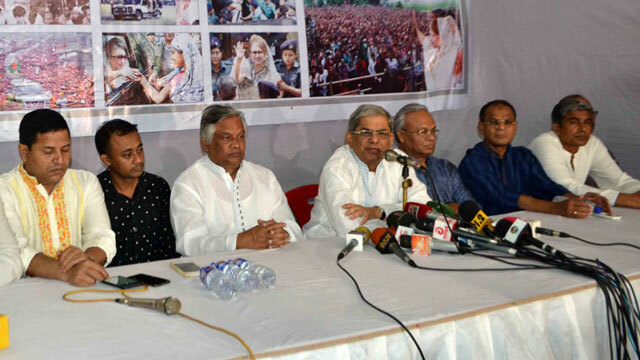 Dhaka, May 11 (Just News): Calling up on Prime Minister Sheikh Hasina to take the election of Malaysia into account, the BNP today said Awami League will meet the same consequence if public sentiment goes against the government. "I request the illegal government and the illegal prime minister to see the result of Malaysia election how public sentiment is established when a government indulges in corruption and goes against democracy," BNP Secretary General Mirza Fakhrul Islam Alamgir said. While addressing a programme at the party's Nayapaltan central office this noon, Fakhrul also called upon the countrymen as well as the leaders of different political parties to form a national unity to rid the autocratic rule of the Awami League. Mahathir Mohamad was sworn in as Malaysia's seventh prime minister yesterday following his stunning election victory over the coalition that has ruled the Southeast Asian nation for six decades since independence from Britain. Referring to the election result, Fakhrul said people's opinion was established in Malaysia through the election. Claiming that Khaleda Zia has been confined in jail in connection with a false case, the BNP leader said everything has been done only to keep the party chief away from politics in a planned way to stage another lopsided national election. About the Khulna City Corporation election, Fakhrul blamed the government for staging a drama in the name of holding election. The government’s tricks centering the Gazipur City Corporation election has been understood by the people, he said.